DaVinci Resolve combines professional non-linear video editing with the world’s most advanced color corrector so now you can edit, color correct, finish and deliver all from one system! DaVinci Resolve is completely scalable and resolution independent so it can be used on set, in a small studio or integrated into the largest Hollywood production pipeline! From creative editing and multi camera television production to high end finishing and color correction, only DaVinci Resolve features the creative tools, compatibility, speed and legendary image quality you need to manage your entire workflow, which is why it is the number one solution used on Hollywood feature films. DaVinci Resolve 12.5 includes sophisticated professional editing tools designed to handle a wide range of projects from scripted prime time dramas to fast paced stylized commercials and even multi camera productions. Editing tools are context sensitive, which means that DaVinci Resolve automatically knows how you want to trim based on the position of the mouse so you don’t have to waste time switching tools! You also get customizable keyboard shortcuts so you can edit quickly and move between applications with ease. Now with virtually every imaginable editing and trimming tool available, it’s easier than ever for editors to switch to DaVinci Resolve! 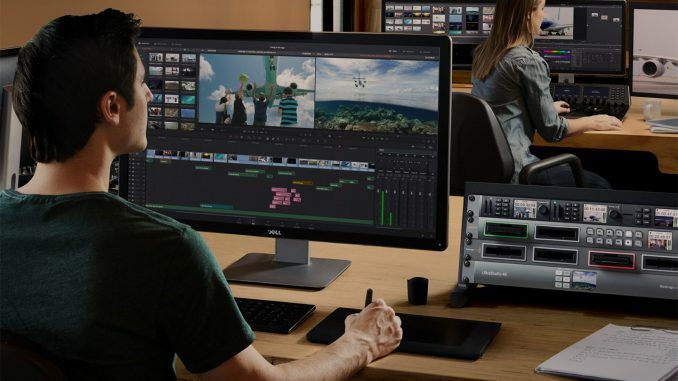 DaVinci Resolve is scalable and supports multiple GPUs all working together as found in the new MacPro, as well as the latest Windows and Linux computers. You get support for up to 8 GPUs so that you can build dedicated systems that are super fast and deliver blazing real time performance. You can even offload output and rendering tasks to other Resolve systems on your network using the remote rendering tools. That’s important when you are working on high pressure projects that you need to deliver fast! Whether you are working in your own post production suite or grading the next Hollywood blockbuster, workstations running DaVinci Resolve can be super charged to keep up with you and your clients! Please click here to download Davinci Resolve.